Leading-edge research groups in the field of scientific computing present their outstanding projects using the High Performance Computer in Bavaria (HLRB), Hitachi SR8000-F1, one of the top-level supercomputers for academic research in Germany. The projects address modelling and simulation in the disciplines Biosciences, Chemistry, Chemical Physics, Solid-State Physics, High-Energy Physics, Astrophysics, Geophysics, Computational Fluid Dynamics, and Computer Science. The authors describe their scientific background, their resource requirements with respect to top-level supercomputers, and their methods for efficient utilization of the costly high-performance computing power. 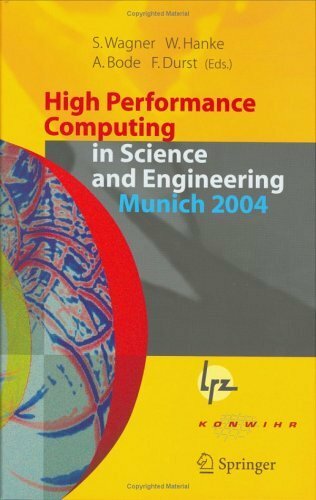 Contributions of interdisciplinary research projects that have been supported by the Competence Network for Scientific High Performance Computing in Bavaria (KONWIHR) complete the broad range of supercomputer research and applications covered by this volume.